Companion planting is an ancient practice where each plant provides some function in the garden scheme. Often, companion plants repel pests and actually seem to aide in each other’s growth. Companion plants for leeks will help prevent populations of predator insects while enhancing growing conditions. The strong scent of leeks isn’t a good combo with every plant, but a few hardy souls don’t mind a little onion breath and make great leek plant companions. 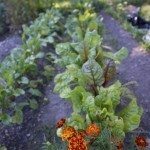 Not every gardener believes in the power of companion planting, but enough do and know that their gardens are protected against pests and certain crops thrive when planted near each other. While there isn’t any specific science, companion planting would seem to support crop health in many cases. Several pests make leeks their target. Allium leaf miner, leek moth and onion maggots are but a few of the insects and their young that target plants in the family. Finding the right companion plants for leeks can help prevent or repel certain of these pests and ensure the health of the crop. One purpose of companion planting is as a support. Consider the Three Sisters method of planting. It is a Native American method of combining the crops of corn, beans and squash. The combination served several functions. First of which, beans helped fix nitrogen in the soil to the benefit of the other plants. Corn provided a scaffold for the beans to climb, while the squash was a living mulch, cooling soil and preventing weeds while conserving moisture. Companion planting with leeks primarily serves the purposes of a natural insecticide, but these plants can be combined with many other crops and even flowers. While leeks don’t need support and they don’t make adequate support for other crops, their potent odor can help other plants with their pest problems. Some traditional companion planting combinations make culinary sense. Take tomatoes and basil, for instance. These are classic crop buddies and it is thought that basil helps repel flying insects that attach the tomato crop. They are also delicious together. Some of the plants that like leeks would make terrible menu items but work nonetheless. Strawberries seem to enjoy living next to leeks, and the strong odor of the leeks repels many pests of the berries. Other leek plant companions might be cabbage, tomatoes, beets and lettuce. The leafy vegetables, especially, seem to benefit from the strong scent of plants in the Allium family. One of the best plants that like leeks is the carrot. Carrots are plagued by carrot flies and leeks are eaten by onion flies. When the two plants are near each other, the individual aromas seem to repel each other’s pests. Plus, as root crops, they share in breaking up the soil as they grow, making it loose for better carrot roots and larger leek bulbs. Other plants to try are more attractive. Use calendula, nasturtium and poppies as covers for the leek and repellents due to their pungent herbal flavor and aroma. A side note on what to grow next to leeks should include what not to grow near these plants. Apparently, beans and peas do not thrive near any member of the onion family. As mentioned, there is no real research confirming the usefulness of companion planting, but its tradition is long and storied. Read more articles about Leeks.